Lizards in your home or garden can be a nuisance, especially if you fear the scaly reptiles. While geckos and skinks, both different types of lizards, may help in keeping the bug population to a minimum, many people prefer the creatures stay outside. Geckos come in over 1,000 varieties and live primarily in hot climates like deserts and the tropics. Skinks have evolved to over 600 species and also inhabit warm climates in areas such as the forests of Africa and the southeastern United States. Regardless of whether it's a gecko or skink bothering you, you can deter their presence. Although relatively harmless, geckos can be a frightening and annoying houseguest for people who would rather the creatures stay outside. Clean your home so that geckos and skinks have nowhere to hide if they have come inside of the house. Remove piles of laundry, papers and other clutter. Take trash and food scraps out on a regular basis to help reduce the risk of flies and other bugs inside of the home. Insects are a food source and attractant for lizards of all kinds. Place bug traps throughout the interior and exterior of your home to help eliminate insects and reduce the availability of food for geckos and skinks. Contact a pest control professional and arrange to have the exterior of the house sprayed with insecticide as a more potent line of defense. Inspect the outside of the home for any sources of standing water, such as buckets that have collected rainwater or dirty swimming pools and drain the water to eliminate insect breeding grounds around the home. 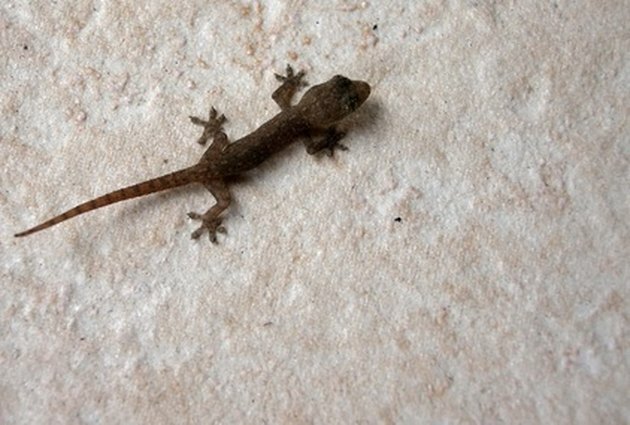 Reduce the chance of geckos and skinks entering the structure by repairing any cracks in the foundation of the home, spaces between the siding and the house or leaky windows. Lizards don't require a large opening to sneak into a home and sealing possible points of entry will help reduce the risk of geckos and skinks getting inside. Try to keep doors and windows shut as much as possible to prevent an open invitation for animal entry. Adopt a house cat to help scare away geckos ans skinks. Most cats are more than willing to track and chase away lizards both inside and outside of a house. While cats are typically disturbed by unknown animals moving about their space, lizards are equally as frightened by the presence of a feline. Remove any geckos or skinks that you find inside the home by placing a cardboard box in a nearby corner. Use a broom to encourage the lizard to run toward the box and gently push the gecko or skink inside the waiting box. Promptly flip the box upright and place a second piece of cardboard over the opening at the box top. Relocate the lizard outside, far enough away from the house that it won't immediately reenter the dwelling.